We are challenging to realize hand shape recognition using a wrist-worn device. Potential applications are remote control of home electronics, gaming interface and so on. 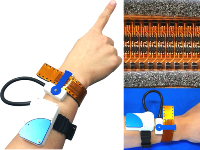 With arrays of photo reflectors, the device acquires the shape of a wrist contour that varies with contraction or flaccidity of muscles and tendons of fingers. Wrist contour data from approximate 30 subjects are acquired with the device. In hand shape classification experiments with the data, it was confirmed that there are some resemblances among subjects. The developed device can estimate pronation angle with its IMUs. With he device, we collected wrist contour data are collected and analysed them. Through a hand shape classification experiment, it is revealed that wrist contour data have hand-shape-specific features or information of pronation angle.